Subject:Asian vase of unknown origin and history. Help with ID required please. Hi all, the vase below was gifted to me by my family when my grandmother passed away. I'd always taken a liking to it and my Nan, in her later years, could not remember where it was acquired from. My Grandad was in the Merchant Navy so did travel the world so wondering if it was obtained during that period however I've no idea on age etc - my personal opinion is that it seems more recent than something made/bought back in the 1940's. 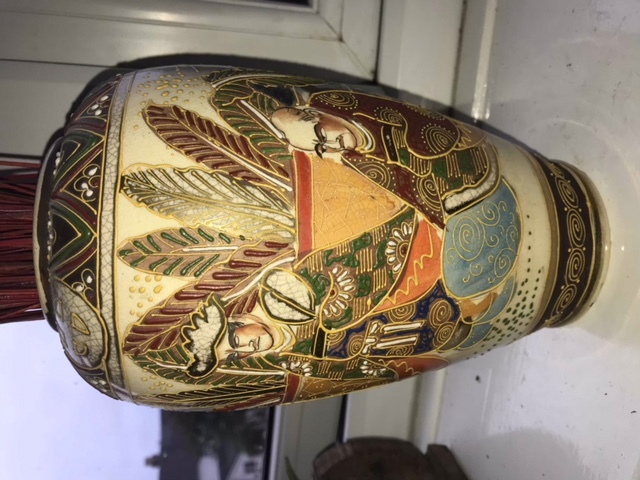 Any info on year, country and maybe even an idea of the subject of the vase decoration would be appreciated. Thanks in advance for any information given. 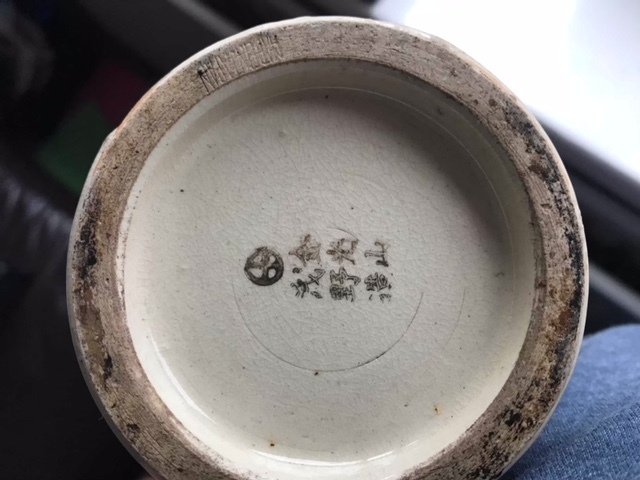 Subject:Re: Asian vase of unknown origin and history. Help with ID required please. Although some of the Japanese Kanji characters are a little faded, the mark is: Kinkozan 金光山 Asano Zo (Kinkozan - made by Asano), underneath a Shimazu mon. Asano was probably a potter and/or painter working for Kinkozan. There is a lot more to find on the internet about Kinkozan. Even a number of vases with the same signature as yours, but I could not found anything about this Asano. Most of the Asano marks have also "Made in Japan" on the bottom as well. I have a set of 2 vases with this mark myself. Kinkozan closed in 1927, so date 1920-1927. Brilliant thanks Martin - very useful. This is a Satsuma earthenware vase from Japan. It seems dating from the 40's,not earlier as the inscription"Made in Japan"indicates. Superb - thanks Remy, much appreciated.